In spring GIG Karasek was represented at of the two most important fairs of the year 2016. First, in mid-April at Powtech in Nuremberg, the leading exhibition for mechanical processing technologies, instrumentation and handling of powders and bulk solids. GIG Karasek was able to present its comprehensive portfolio of special apparatuses and equipment for the chemical and pharmaceutical industries to international visitors. From May 30 to Jun 03, we went to Munich for the world's leading fair for environmental technology, IFAT. Again GIG Karasek convinced the broad professional audience with its expertise in the fields of evaporation, distillation and drying. Especially the "Sludge Drying" was an important issue here. At both fairs GIG Karasek could take the interest of the visitors with his experience, flexibility and high quality standards and so some extremely impressive and attractive partnerships, collaborations and contracts emerged. GIG Karasek will continue to provide all the technical challenges, whether in traditional areas of application or unconventional. According to the company motto "Maximize your yield with the best!" 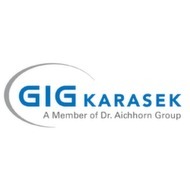 GIG Karaseks priorities collaborate with the demands and needs of the customer.